We would like to introduce you to the world of pattern imprinted concrete and what practical benefit, visual enhancement and value it will add to your property. Concrete has been a solid, reliable and enduring product within all aspects of domestic, industrial and commercial building industries for years and has stood the test of time. 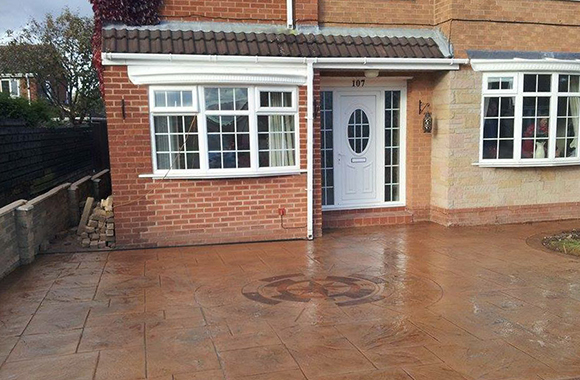 Within the last few years, 'PIC' (Pattern Imprinted Concrete) has superseded its rivals such as block paving, 'PIC' is installed by using selective moulds and non-fade dye's which are impregnated into a smooth finished concrete surface and tamped down to provide the pattern imprint, this is then repeated throughout the required area. The dye also acts as a surface hardener to provide extra durability and when sealed can be 25% harder than conventional concrete. Concrete can be coloured in a variety of ways through the use of concrete stains, integral colour, colour hardeners, or concrete dyes. The type of colouring method is usually chosen based on the application where it will be applied. For example, will it be indoors or outdoors? Some colours are not UV-resistant. Are neutral tones desired or brighter, more vibrant tones? Stains will impart more naturally-coloured neutral tones, whereas dyes will give brighter colouring. With a range of colours and patterns to choose from, you can tailor your imprinted concrete installation to your personal taste. Prior to work commencing, the initial part of our process is one of the most important and that is for us to visit you to establish your pattern, colour and imprinted concrete design requirements. We will design and produce a drawn-to-scale plan with all the relevant points and preferences based on your requirements to ensure we provide you with exactly what you require. This may include: Colours | Patterns | Boundary Lines | Planters | Steps. During the visit, we will also offer you information on the various stages of the processes involved in the installation and answer any questions you may have. Once you have confirmed your requirements, we will give you a week commencing date for the work to start. Obviously the UK weather plays a huge part in the scheduling process and therefore it may be subject to change. The next stage of our process is site preparation. This stage of the installation should usually take a day, as machinery will be used whenever possible to speed up the preparation process. However, the preparation may take longer in areas where there is inadequate access for machinery such as patios and rear garden areas, as this will need to be prepared manually. During this process, existing material will be removed to ensure a good sub base of at least 100mm and 100mm of concrete can be laid efficiently, and any drainage systems required will be fitted. At this stage, the preparation is complete and ready for the concrete to be poured and printed. The third part of our process is the formulation stage, this consists of the laying of the concrete to a minimum of 100mm and it's levelling to any drainage points that may be fitted. The colour hardener is then trowelled and floated into the concrete to ensure a smooth finish. When ready, the concrete is then imprinted with a pattern of your choice. The concrete should be left undisturbed for 24 hours. Once the concrete has set, the residue of the colour hardener and release agents will be washed away and the sealer applied. This finishes the process and once the sealer has dried, your new pattern imprinted area will be ready for use.